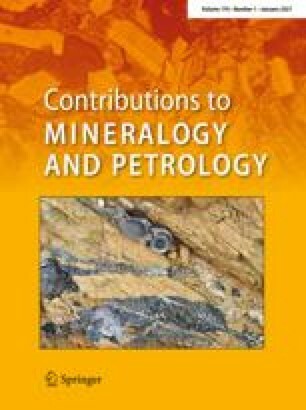 We report the first Nd isotopic data on the cumulate rocks of the Bushveld Complex, South Africa. We analysed 17 whole-rock samples covering 4700 m of stratigraphy through the Lower, Critical and Main Zones of the intrusion at Union Section, north-western Bushveld Complex. The basal ultramafic portions of the complex have markedly higher ɛNd(T) (−5.3 to −6.0) than the gabbronoritic Main Zone (ɛNd(T) −6.4 to −7.9). The rocks of the Upper Critical Zone have intermediate values. These results are in agreement with new Nd isotope data on marginal rocks and sills in the floor of the complex that are generally interpreted as representing chilled parental magmas, and with published Sr isotopic data, all of which show a larger crustal component in the upper part of the intrusion. In contrast, the concentrations of many highly incompatible trace elements are decoupled from the isotopic signatures. The basal portions of the complex have higher ratios of incompatible to compatible trace elements than the upper portions. The variations of isotopic and trace-element compositions are interpreted in terms of a change in the nature of the crustal material that contaminated Bushveld magmas. Those magmas that fed into the lower part of the complex had assimilated a relatively small amount of incompatible trace-element-rich partial melt of upper crust, whereas magmas parental to the upper part of the complex had assimilated a higher proportion of the incompatible trace-element-poor residue of partial melting.